Washington (AFP) – A noisy technology that blasts high-frequency sounds below water to map the ocean for oil probably caused the deaths of 75 melon-headed whales off Madagascar, experts said Thursday. An independent panel of scientists found that sonar surveying by ExxonMobil in late May 2008 led to the sudden displacement of around 100 whales, of which at least three-quarters died. “This is the first known such marine mammal mass stranding event closely associated with relatively high frequency mapping sonar systems,” said the report released by the International Whaling Commission. The researchers described a “highly unusual event” in which melon-headed whales became stranded in shallow waters in the Loza Lagoon system in northwest Madagascar in May and June 2008. The culprit was named as a high-power 12 kilohertz multibeam echosounder system, or MBES, operated by an ExxonMobil vessel on May 29 about 65 kilometers (40 miles) offshore from the first known stranding. The report said that seismic airguns, long opposed by environmental groups for the potential harm they can cause to marine life, were not to blame for the event. “They used the multi-beam echo sounder first. That scared the animals into the lagoon and then the air guns were used afterward,” explained marine scientist Matt Huelsenbeck of the advocacy group Oceana. A spokesman for ExxonMobil said the company disagrees with the findings. “ExxonMobil believes the panel’s finding about the multi-beam echo sounder is unjustified due to the lack of certainty of information and observations recorded during the response efforts in 2008,” spokesman Patrick McGinn told AFP in an email. Nevertheless, the company has, since 2008, developed a “detailed risk assessment process” that takes into account the local characteristics and the potential for harm to marine life, McGinn said. High frequency echo sounders are often used to map the ocean floor and can be dangerous to smaller whales and dolphins, while the air gun blasts that follow are lower frequency and may endanger large whales, according to Oceana. “Now we are seeing that (sonar) disturbance is an even more important thing than was previously assumed,” said Huelsenbeck. 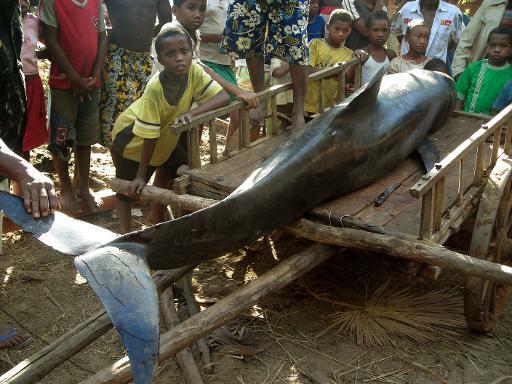 The evidence was compiled by the International Whaling Commission, the US Marine Mammal Commission, the US National Oceanic and Atmospheric Administration, the US Bureau of Ocean Energy Management, ExxonMobil, the International Fund for Animal Welfare, the Wildlife Conservation Society and the Government of Madagascar.